- Users resizing filesystems using resize2fs. - Resizing an existing Linux filesystem from the Ubuntu installer. This changes behavior in the update logic for extent blocks; as such, care should be taken to make sure that testing takes into account the possibility to introduce filesystem corruption while resizing. This is why the test cases include running e2fsck as last step. Attached is the journal of the system installed on the corrupted partition. Do you get this screen? Last night this problem made me go crazy. Because if you install again 2 os's for dual boot the problem will NOT persists. I can't reproduce this problem the second time. @Apolihron, yes but depending on the corruption the system can go into initramfs if it completely fails to boot (your screenshot), it may boot but the FS will be RO, or it may recover transparently and all sort of other side effects are possible. @APoliihron, when it happened to you what was the original operating system that you resized? Was it cosmic on cosmic or something else? In Kubuntu with Virtualbox, I end up with the resized Cosmic partition bootable and starts, but read is read only. 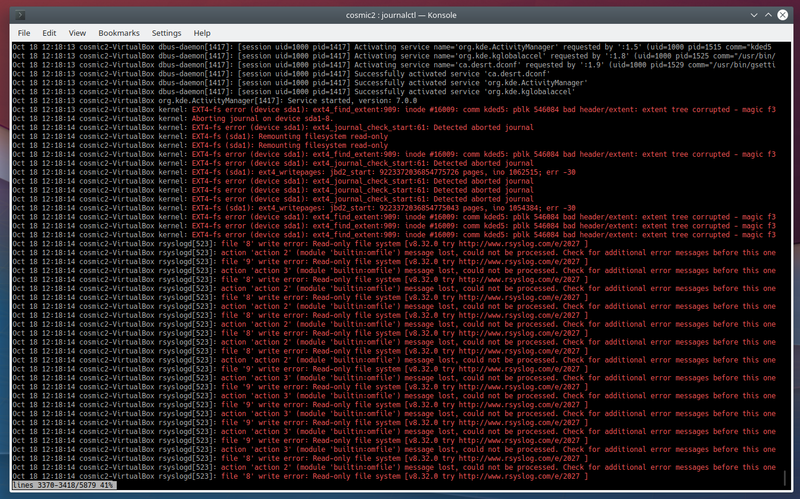 Plenty of KDE error not being able to write config files to the user home. Ext4 errors shown in attached screenshot. Apparently it's clearly reproducible with Cosmic alongside Cosmic. Has anyone been able to reproduce with Cosmic alongside something else than Cosmic such as an earlier release, another distribution or operating system? Just reporting that I was unable to reproduce it in any system combination, even in the original cosmic next to cosmic case. Same for bionic on cosmic, cosmic on bionic, cosmic on fedora. So it seems the issue is not easily reproducible in all cases, must be some specific combination of components and/or race? Personally I've fone this first install entire disk ->boot in the os and restart it -> install alongside-> boot in the second os and then restart and boot in the first one.all in uefi mode. I've tested e2fsprogs with this change and it fixes your repro. I also have a regression test in the subsequent commit which reproduces the problem with a smaller test file system. The attachment "resize2fs: update checksums in the extent tree's relocated block" seems to be a patch. If it isn't, please remove the "patch" flag from the attachment, remove the "patch" tag, and if you are a member of the ~ubuntu-reviewers, unsubscribe the team. and after doing that from live disk ( i saw it was asking to move nodes which repairing ) the next time system reboots the kernel panics, errors were " not syncing attempting to kill" ," bad RF code "
This has been fixed in the e2fsprogs version in Disco. Accepted e2fsprogs into cosmic-proposed. The package will build now and be available at https://launchpad.net/ubuntu/+source/e2fsprogs/1.44.4-2ubuntu0.2 in a few hours, and then in the -proposed repository. Accepted e2fsprogs into bionic-proposed. The package will build now and be available at https://launchpad.net/ubuntu/+source/e2fsprogs/1.44.1-1ubuntu1.1 in a few hours, and then in the -proposed repository. 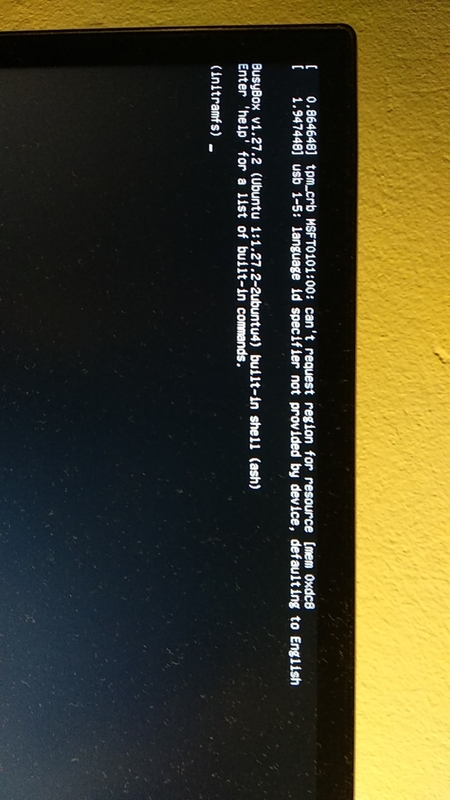 - There was a test installation of Ubuntu 18.04.1 LTS in a Toshiba laptop with an SSD. - I cloned a Lubuntu 18.10 iso file to a USB pendrive and installed the necessary program packages. - Finally I rebooted into the new Lubuntu and ran 'sudo e2fsck -f /dev/sda1' and, as expected, there was no complaint. I installed e2fsprogs 1.44.4-2 via cosmic-proposed, according to the instructions. Resizing the filesystem on vda1b.raw to 1587200 (4k) blocks. The filesystem on vda1b.raw is now 1587200 (4k) blocks long. The verification of the Stable Release Update for e2fsprogs has completed successfully and the package has now been released to -updates. Subsequently, the Ubuntu Stable Release Updates Team is being unsubscribed and will not receive messages about this bug report. In the event that you encounter a regression using the package from -updates please report a new bug using ubuntu-bug and tag the bug report regression-update so we can easily find any regressions.